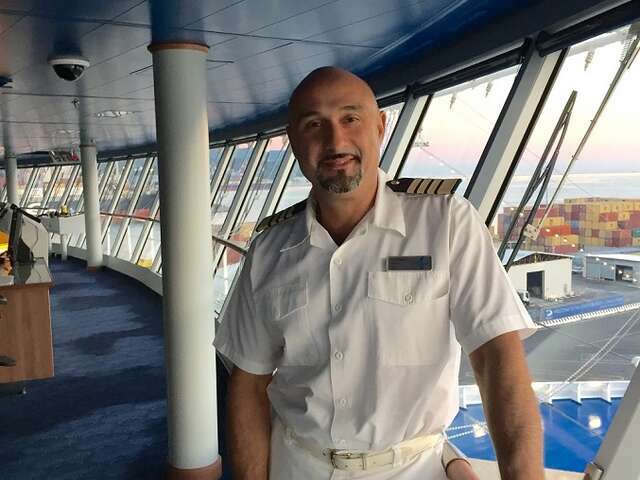 We recently caught up with Captain Manzi on the bridge of Riviera, an Oceania Cruise Ship to learn about his typical day on the job, his favorite dish at Toscana, what to try in Italy and more. If you have been on an Oceania Cruise you may recognize the smiling face of Captain Luca Manzi. Hailing from the small village of Chiavari just outside of Portofino, he has been with Oceania Cruises since the beginning. As the Master of the ship, I am ultimately responsible for the safety and well-being of more than 2,000 souls on board as well as the ship keeping schedule, proper navigation, maintenance and upkeep. I’m also the “patriarch” of this floating village which translates into myself and all of the department heads ensuring our crew is happy and healthy. A happy crew makes for happy guests which makes for a happy ship! Every day is different, so “typical” may be hard to describe. I am usually up by 4:30 in the morning to begin the day with an espresso and a quick bite before we begin maneuvering into port. We will pick up the pilot, enter the harbor, and the Staff Captain and I will bring the ship to her berth. After the ship is secured, there is a morning briefing with the department heads, I do my rounds, and finish out the morning with tackling any paperwork. I’ll spend the afternoon in my office, perhaps take 30 minutes to stroll ashore and then will retire for a nap so that I am refreshed before we depart. The Staff Captain and I will take the ship out of port, which is usually followed by dinner and I’m usually in bed by 21:00 or 22:00 hours to be fresh for another early morning arrival. What is your favorite cruise moment? Welcoming our guests back home. I try to be at the gangway every afternoon, at least for a brief period, to say hello and welcome guests back home from a day of exploring. I sometimes even help with the many shopping bags! I love seeing the smiles on the faces of our guests after a day of making new memories and seeing new places. What dish do you love ordering at Toscana, our Italian restaurant on board? It’s funny – I always tend to order the pasta of the day. You can’t go wrong with this choice, the chef is always cooking up something very nice and traditional. Reminds me of home. What about your favorite port? I know this will surprise you, but they are ports in Italy. I was born on the Ligurian coast, so Portofino, La Spezia, Genoa, and Livorno are close to my heart. They are such true Italian places, you must discover them as well as places like Tuscany and Florence for which these cities are sometimes just a gateway. There’s incredible beauty hiding in plain sight. What do you recommend guests try when they are in Portofino since your hometown is so close? You really must try focaccia al pesto.You will really enjoy it – and you won’t find it like this anywhere else. What is your OLife Insider Tip for guests? Don’t ignore the port cities the ships tie up in. They may not be the biggest tourist attractions, but you will find many special moments, memories and people in these cities. Don’t follow the herds, wander off the prescribed path sometimes – you will be glad you did.